Have you always wondered how to use dry shampoo without getting all the buildup? Sales of dry shampoo skyrocketed around 2011, but it’s actually been around since the Victorian era. Rumor has it, Marie Antoinette used perfume-laced powder in her hair to get her signature bouffant-styled up do. Not everyone needs dry shampoo, but everyone can benefit from using it. If you’re looking to prolong the time in between shampoos, it’s definitely for you. It can also be used as a styling tool. “Dry shampoo eliminates odor and oil, but it also helps to add body to the hair so even if it’s not oily, you can still use dry shampoo on day two or three or four of not shampooing just to revitalize the hair,” says Redken Artist Adina Doss. Doss also mentions that often people don’t use dry shampoo correctly either. 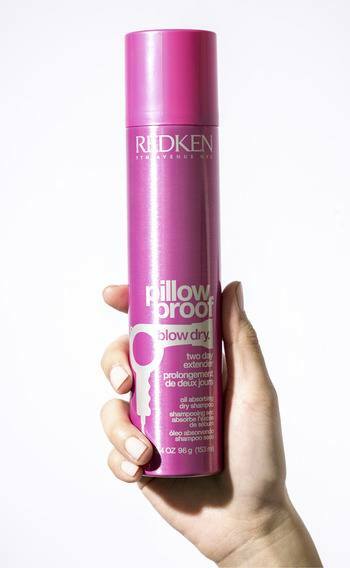 Using Redken’s Pillow Proof Blow Dry Two Day Extender Dry Shampoo or Pillow Proof Two Day Extender Dry Shampoo for Brown Hair, which is tinted, make small vertical parts in hair and spray the shampoo on each section, Doss advises. Hold the dry shampoo at least six-inches from hair, about the length of the can, so the product isn’t concentrating on one spot. For more texture, blast hair with a blow dryer to move the dry shampoo around scalp, then add styling products over the dry shampoo to give hair a revamp. The fresh scent will make hair feel freshly washed, and the matte finish will give it a nice refresh. Dry shampoo can also be used proactively as well. Spritz your roots with some dry shampoo before going to bed to get ahead of any grease. CAN I USE DRY SHAMPOO FOR VOLUME AND STYLING? Absolutely! Dry shampoo can also add dimension to hair. VanDyke uses the Pillow Proof Two Day Extender Dry Shampoo for Brown Hair when styling up-dos and creating braids to darken the sides of the scalp that are often more visible in these styles. “Spray it on really lightly and it kind of fills in those gaps and gives you a thicker appearance,” she says. Make no mistake, dry shampoo can definitely be overused. It’s easy to get spray happy, especially when you’re feeling greasier than normal. While, Pillow Proof is not going to weigh hair down, it will build up after multiple uses throughout the week, in which case adding a cleansing cream is important. “Try the Hair Cleansing Cream Shampoo once a week to clear everything off your hair and your scalp,” VanDyke says. All in all, dry shampoo is an absolute must-have for anyone who needs a few extra minutes in the morning (so…pretty much everyone). Share your second (or third!) 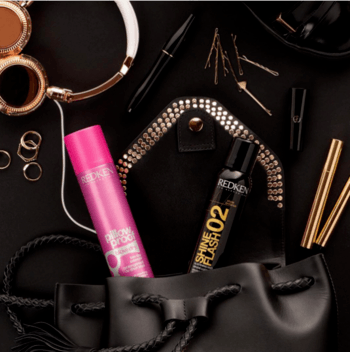 day hair with us by tagging @Redken in your next Instagram post! Explore haircolor trends and inspiration to help you find your next look. Blondes have more fun at Swerve!